Idol-themed anime/games is not a new thing but if I remember correctly I first noticed them since Idolmaster. Then a few other came into existence such as AKB00048, Symphogear, Wake Up Girls and the more recent one, Love Live (just to name a few). I'm not going to call the fans 'stupid' but I feel stupid if I watch those series (or play the games). 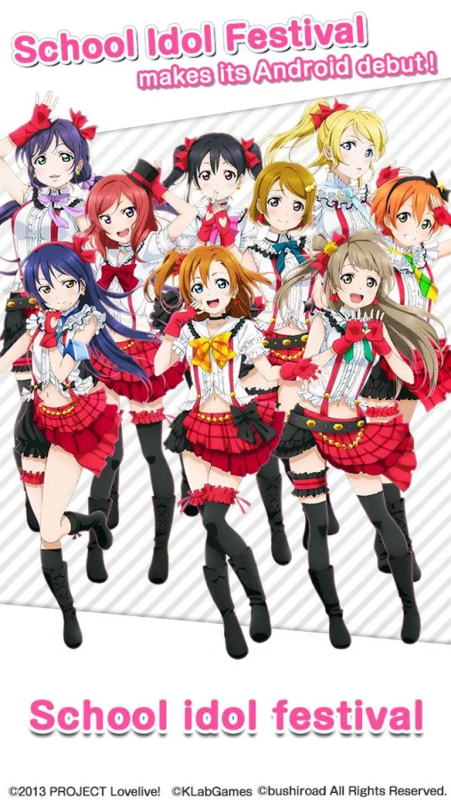 The Android game based on Love Live. In case you're interested get it here. I can say my real problem with such anime/games is that I'm never interested in idol units in real life. I 'despise' AKB48 whose members were so many they could fill a ship (not to mention there are also non-Japan version of them which can be found in Hong Kong, Jakarta and a few other places). Personally the only idol group tolerable to me is Momoiro Clover Z because of their 'clean' (no bikini) image as well as their 'powerful' performance that would require stamina. I've had the game School Idol Festival above installed in my Android tablet for quite some time now (I'm probably among the earliest to get the game which just arrived in Google Play Store recently). However I haven't even opened the game and have no idea how to play it. I'm not really the 'tester' type but more of the 'observer' type and I'm using that trait of mine to observe some of my friends (who also just started) playing the game and posted their progress online. So far it failed to make me interested, though from what I see it's some sort of collectible cards game plus visual novel/dating sim elements. Since I mentioned that I'm an 'observer' so let's go off-topic for a bit. As an observer I'd love to live forever (with eternal youth, not just mere immortality) that would allow me to witness every history in the making and love to tell the story. Honestly I don't think it's a bad idea even if it means I stopped evolving (of which at one point, millions of years in the future human today would probably be equivalent of proto human from millions of years ago to us). If I were to be offered immortal life like that I'd like to have the one that doesn't need food, water, air and sleep so that I could concentrate on observing without any of those life-essential things getting in my way. Back to the topic, I think if there's one title I have to pick then I think I'd pick Wake Up Girls. I haven't watched it yet but from the synopsis and reviews I've read elsewhere it doesn't sound as silly as Idolmaster and Love Live, also doesn't have silly enemy-fighting premise like in AKB00048 and Symphogear. I don't mind with cute girls in cute costumes fighting monsters but I think it's better to keep idol them away from them (Vividred Operation is a good example) or just make them a mahou shoujo show minus the singing (Madoka Magica FTW! ).